Home time is family time. Kids need time to play and reboot for the next school day, not go into overtime. Schooling may be mandatory, but homework isn’t. When children hit school-age, sometimes it feels as if the school is suddenly in charge of your family life. Night after night parents lock themselves in battles with overtired kids. “You have to do your homework,” we say, even when deep inside we know that the crying, wiggling child stuck in the homework chair desperately needs something else. Time to just be home, relax and play. Help with family chores. Or go to bed. But we think we must uphold homework, so we do. We nag. Cajole. Fight. Beg. And as a last resort, we do our kid’s homework. Step away from the homework culture and stand up for children’s rights. You’ll be surprised to learn that research supports this. A comprehensive review by Dr. Harris Cooper, a psychologist and neuroscientist at Duke University, of 180 research studies shows homework has no evidence of academic benefit for elementary school students. You read that right. Startling, isn’t it? The research says no academic benefit at young ages. Homework does have an impact, though. The same slew of studies show it increases emotional problems: negative attitudes towards school and high conflict in families. What research consistently shows is that homework benefits are age-specific. Homework belongs in high school. In middle school, there’s slight academic benefit, and none in the elementary years. Given these facts, it makes sense to give kids some practice assignments in middle school, but not too much. Even in high school, more than two hours of homework doesn’t help. I didn’t yet know this research when my oldest child entered first grade, but I knew my child. I knew what he needed – and what he didn’t need – and was willing to buck the system and trust my gut. When school was over for the day, I knew this six-year-old needed time to run outside, make noise, make faces with his brother, and simply pursue his own interests. Children are told what to do all day long at school. They need time to move their bodies and think their own thoughts. I grew up without homework in elementary school, so I was already comfortable with the idea. I knew kids could learn and flourish without it. My childhood elementary school had no worksheets, no textbooks and no chairs, and yet we typically scored at the top of the district when worried officials came in and administered standardized tests. Our school was filled with the joy of learning. In a homework-dominated culture, I think we forget joy. Joy is part of learning. Kids are wired to learn just as they are wired to play. But homework at a young age can squash that out. Learning gets a bad name. Learning gets equated with homework. Homework is mainly a problem because it’s a theft of time. It’s a grave opportunity cost. And kids feel it. Homework steals kids’ time at home. Time they desperately need to play, connect with family, cope with big emotions, be outside and get good, long sleep. I’m now the mother of a middle schooler. He completes his sixth-grade homework independently, never expecting me to remind him. His younger brother is currently exempt from homework – he knows he can do it if he wants to – but he also knows that there will be a time to get serious in the future. Yes, but how do I do this? I can hear people thinking. The first step is to realize you don’t have to be a Homework Enforcer, you can be a parent. Parents are in charge of their children’s upbringing. Your child’s teacher is your partner in this, and good partners tell each other when something is wrong. 3) a reduction in assignments everyone can live with. Still, no matter what the school reaction, you have the right to decide what goes on in your home and family. If you encounter a teacher who won’t budge (and won’t look at the established research), you can respectfully boycott homework, change teachers or find a new school that’s a better fit. Tasha’s mother, for example, got nowhere with her daughter’s first grade teacher. They continued to opt out of homework as a family all year and Tasha still moved up to second grade. It can be scary to question school routines. If you’re ready to reduce homework load or opt out, there are sample scripts, ideas and sample letters in my book It’s OK to Go Up the Slide. Learn why substituting reading for pleasure at home is better than homework, discover respectful ways to opt out, and find ideas to change the homework culture, whether you’re a teacher or parent. Remember that teachers care about kids, and good teachers are willing to listen – both to you and the research. It’s time to stop a practice that doesn’t work. 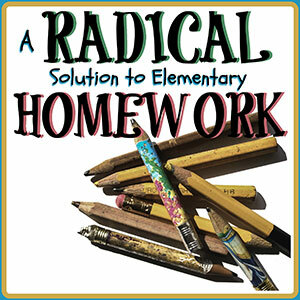 It’s time to think, question, examine the research and ban elementary school homework. Heather Shumaker is a national speaker on early childhood topics and an advocate for play-based learning and no homework in elementary schools. 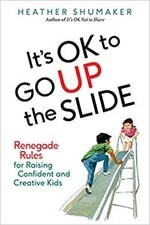 She’s the author of two books, It’s OK Not to Share and It’s OK to Go Up the Slide. Visit www.heathershumaker.com for info, blog, podcast and more.